Being involved in an accident is never a fun experience. Whether it was a small fender bender or a wreck that resulted in severe injuries, accidents can lead to large expenses, increased insurance rates, and even criminal charges depending on what led up to the moment of the wreck. If you have been involved in an accident and you had consumed alcohol beforehand, things can get even more complex. Read on to learn more about what happens when you get into a wreck after consuming alcohol. Remember, anytime you are facing a possible arrest for driving under the influence of intoxicants (DUII), it is best to seek legal counsel right away. As a DUI attorney in Bend, we are passionate about helping our clients through our years of experience in the legal field. We can work with you to build an aggressive case for your defense. Contact us right away if you are facing a DUII. When you are in a wreck, the accident will usually be declared the fault of one party. For example, if the person in front of you stops suddenly and you slam into their fender, you will likely be considered at fault for the wreck as you should have ample space and time to stop without crashing into the vehicle you are following. If this scenario happens and you have been drinking, when the cops show up on the scene, they will likely want you to undergo a breathalyzer test. This test will help the cops determine what your Blood Alcohol Content (BAC) levels were at the time of the wreck. If you blow over the legal BAC, which is .08 percent, you will be considered to have been driving under the influence of intoxicants. DUIIs, also commonly referred to as DUIs, can lead to harsher consequences than normal if you are also found at fault for a wreck while intoxicated. If you wind up in a wreck where you are at fault and you have been drinking, it is critical that you choose a DUI attorney to fight for you in the court of law. Not only will your DUI penalties be potentially harsher, you can also be sued and held liable for injuries that occured to the other parties involved in the accident. What if you were at fault but you don’t blow over the legal limit? Although, normally if you are under .08 BAC levels you would be fine, the moment you get into a wreck, any alcohol you consumed will be used against you. If the other person was 100 percent sober and you had any alcohol in your system, you will be considered the reckless party. What if you were driving down the road after having a few glasses of wine and you wind up in a wreck that you were in no way the cause of? You might assume that since you were not at fault, the fact that you were drinking won’t have any importance. However, even if the other person was 100 percent at fault for the wreck, if you were the one drinking, you can be held liable for the accident. Anytime it is a sober person’s actions up against someone who is intoxicated, the law will look favorably upon the sober party. If you were not at fault but you test over the legal BAC limit, you will still face a potential DUI and could even face an aggravated DUI just as if you were at fault for the wreck. The reality is, once you have consumed any alcohol, your best bet is to stay away from the wheel of your car. Any time you mix drinking and driving, you run the risk of facing a criminal charge. If you have already been involved in an accident where alcohol played a factor, contact our team right away for help. 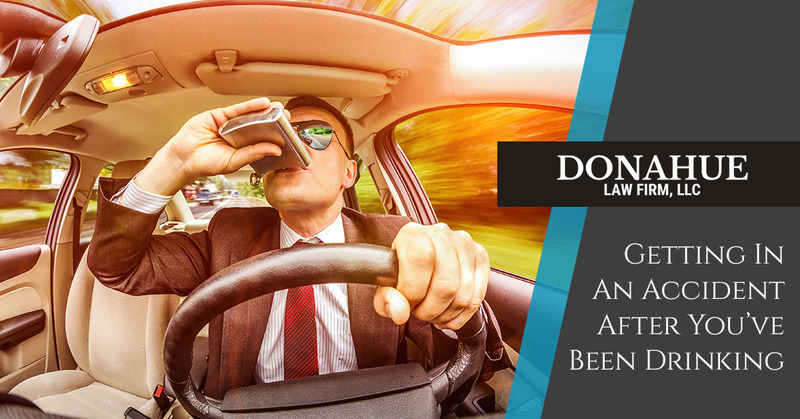 At Donahue Law Firm, we understand DUI law and can assist you in building a case for your defense. Reach out today for a consultation.